PUBLIC REAL ESTATE AUCTION; SATURDAY JANUARY 19th at 10:00 AM; 6917 HOGUE RD in EVANSVILLE, IN; BEAUTIFUL ROLLING 18.5+/- ACRES OFFERED in 3 TRACTS & COMBINATIONS; - Very Nice Updated Home & Pole Barn! - Amazing Potential Building Spots! - Lake & Mature Woodlands! - Fantastic West Side Location Close to USI! - No Buyer’s Premium & Up to 60 Days to Close! Tract #1: Consists of a beautiful 2.5+/- acres improved with a very nice brick home and pole building! 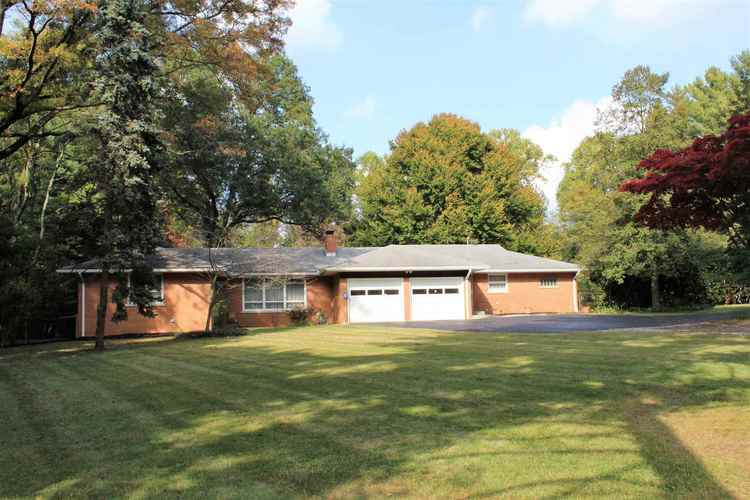 The home, built in 1958, offers approximately 2,128 sqft of living space on ground level. Upon entering, you will find a large entry hall and closet open to a spacious family room. From here you will enter the very nice updated kitchen that is open to the large dining area and living room. The kitchen features solid surface counter tops, stainless steel appliances, and plenty of cabinets, while the living room offers a fireplace and amazing views. The master suite is the perfect retreat and includes a remodeled full bath complete with his & her walk-in closets, custom tile shower, double vanity with swivel mirrors, and lots of cabinets! Completing the main level is a full hall bath, and another large bedroom. The full basement is partially finished and includes a large recreation room, an office, ½ bath, laundry area with sink, and a utility rm/workshop. Other features and amenities of the home include beautiful hardwood floors, an attached 22’x24’ garage, covered patio, fenced back yard, kennel, storm shelter, wiring ready for a generator, and modern HVAC complete with a Honeywell High Efficiency Media Air Cleaner. Please note: someone could easily make a third bedroom in the family room or basement. The pole barn measures approximately 36’x24’x12’ and was built in 2011. It offers concrete floors, garage door openers, lighting and lots of electrical outlets! Tract #2: Consists of 8.5+/- lovely rolling acres of mature woods. It also includes part of the .6+/- acre lake. It would make a wonderful potential building site and has an abundance of wildlife and recreational opportunities. Tract #3: Is another fantastic 7.5+/- heavily wooded acres. It also would include a portion of the .6+/- acre lake and would make an incredible potential building site.